On Saturday we were invited to the President's Tailgate at his residence. This tailgate was completely different than the one I wrote about two weeks ago. It was held in his beautiful lush garden. The tables and chairs were all white, the table cloths white and blue, the colors of the Nittany Lions. There were lots of people there and at the beginning of the Tailgate the President introduced his special guests, and among the special guests were we - the Humphrey Fellows! 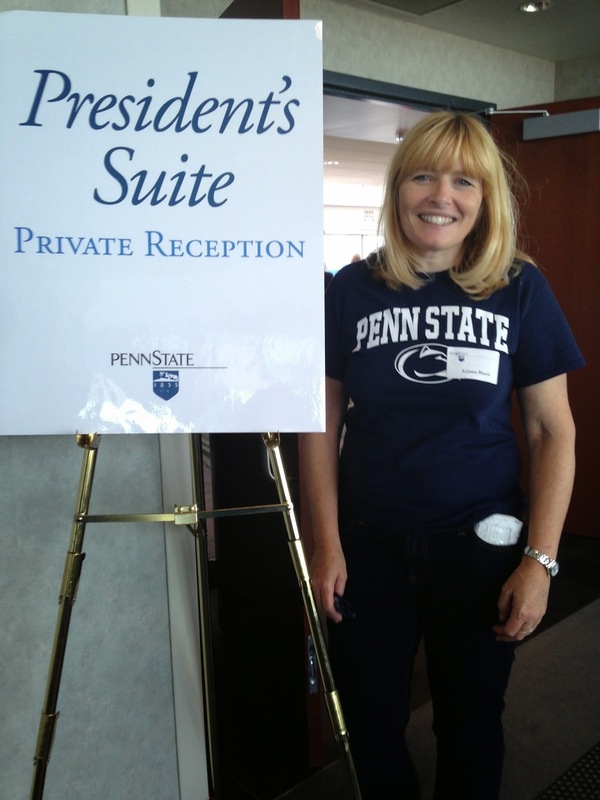 Oh how proud and honored I was to be there wearing my Penn State T-shirt and waving at the other invitees. After the cheerleaders' performance accompanied by the Blue Band we watched a stunning performance of the Musical Theatre group. They danced and sang the songs from the 1920s and the songs, the dance and the setting made me feel as if I was at a fabulous Gatsby's party. The Great Gatsby is one of my favorite books and I felt great! After lunch we were bussed to the President's private reception in his private lounge which is on the top of the Beaver Stadium. Our seats were in the first row and we immensely enjoyed the view, the food, the Berkey Creamery ice-cream, delicious chocolate chip cookies, chatting with other people, and the game of course. I'm not very much into football, but I believe I could go to games like this every Saturday. I even started to learn the cheerleading skills. Apart from being introduced at the Tailgate by the President, we introduced ourselves to the Penn State faculty at two occasions - during the Fall Meeting of the College of Education and at the Comparative and International Education Program Brown Bag lunch. Delicious food was served at all these events, but the real treat was Berkey Creamery. Their Death by Chocolate ice-cream is the best chocolate ice-cream I've ever eaten (and I've eaten a lot of chocolate ice-cream all over the world). No wonder it is the best, because, they say, only 4 days pass between milking the cows in the University's Dairy Production Research Center and selling the ice-cream in the University creamery. As for the classes, this week I had a wonderful and long-awaited opportunity to try the Google Glass. It was an amazing experience and despite its many flaws, I could get used to wearing it and using it every day. If only it wasn't so expensive. Week 4: What's a tailgate anyway?